Acne is a very common skin condition that usually begins in adolescence. The hair follicle and its associated oil (sebaceous) gland become blocked and inflamed. Whiteheads, blackheads and inflamed pus-filled spots develop on the face, neck, back and chest because this is where oil glands are largest and most active. Hormones. At around 8 years of age, the adrenal glands start to produce androgens (male hormone) and the amount produced gradually increases during puberty. The sebaceous glands respond to androgens by producing more sebum and sometimes whiteheads (closed comedones) may develop in young children. Sebaceous gland blockage. The skin cells lining the upper part of the hair follicle duct are not shed as normal but accumulate and form a plug (comedone). The oil is trapped behind it. Bacteria and inflammation. Increased numbers of acne bacteria (Propionibacterium acnes) accumulate in the duct and contribute to the inflammation that develops in the pimples. Genetics. Hereditary factors contribute, however it is not known exactly how this works. Stress. Adrenal glands produce more androgens when an individual is stressed. This can make acne worse. Diet. Certain diets may contribute to the development of acne, however good scientific data is lacking. Occupation. In rare cases people working in certain industries may develop occupational acne where strict Work Health and Safety regulations have not been observed. What does acne vulgaris look like? Whiteheads are small, often tiny, non-inflamed spots under the skin surface while blackheads appear as an open pore with a black plug. Whiteheads and blackheads are usually the first lesions that develop and may be, but not always, followed by the development of red lumps and pustules. If the acne becomes more inflamed then larger, redder, deeper and tender nodules or cysts may develop. 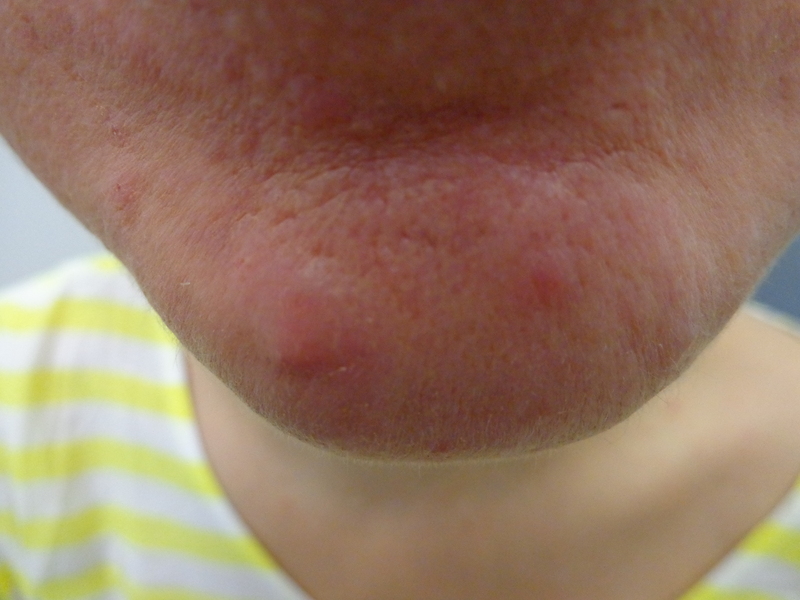 These very inflamed lesions often lead to scarring. 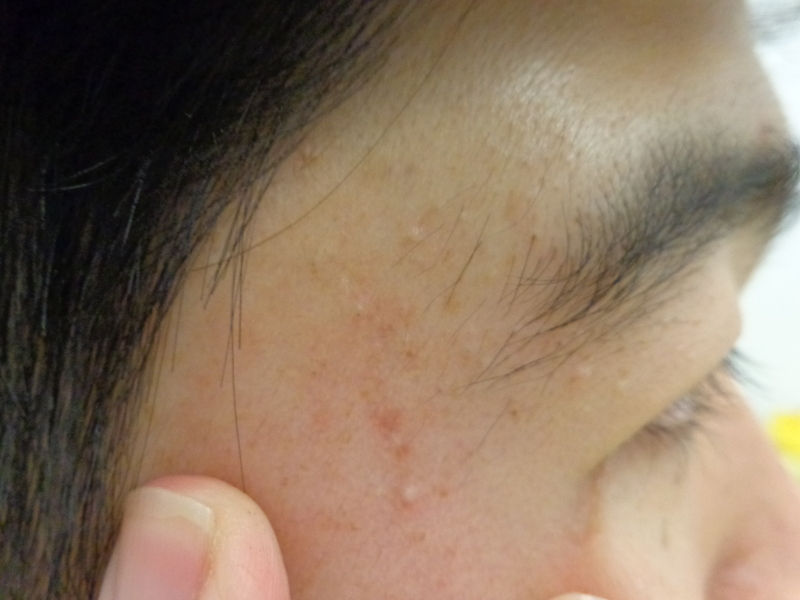 Some drug reactions may result in many small pustules developing on the face and trunk. These reactions are sometimes described as “acneiform drug eruptions”. These can be distinguished from acne because of the absence of comedones (blackheads or whiteheads). What other problems can occur with acne vulgaris? Acne can sometimes lead to a negative self-esteem and some individuals may withdraw from social and sporting activities. It is important to discuss this with your dermatologist or doctor if it is happening or if you are “feeling down” a lot of the time. 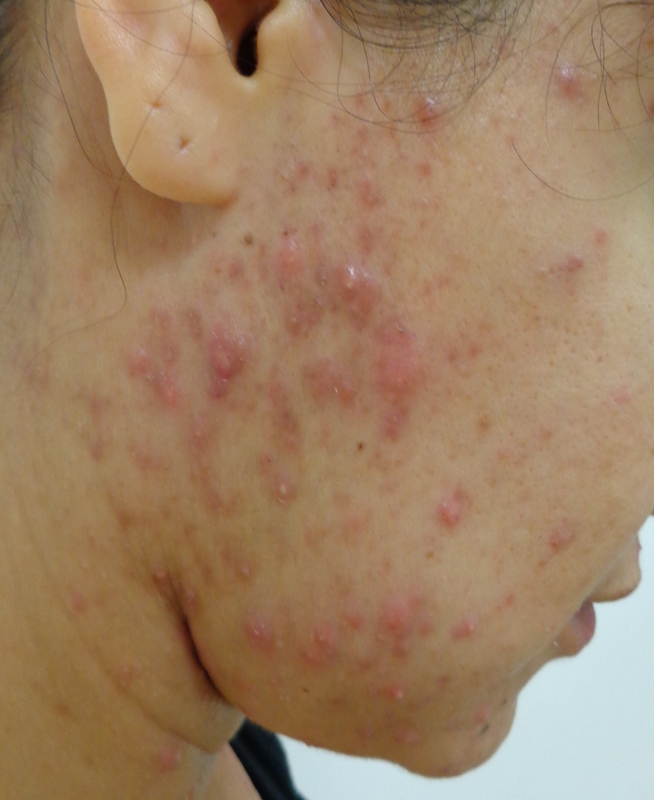 Some females may have acne as part of polycystic ovarian syndrome (PCOS). Other hormonal disorders associated with excess androgen production can also cause acne and require investigation. Being significantly overweight may be associated with more severe and treatment-resistant acne. How is acne vulgaris diagnosed? A doctor diagnoses acne vulgaris by observing the presence of blackheads, whiteheads, papules (red bumps) and pustules on the face, chest or back where large numbers of sebaceous (oil) glands are found in teenagers and young adults. Sometimes acne does not develop until late adolescence, or for the first time in the twenties. This occurs predominantly in women. 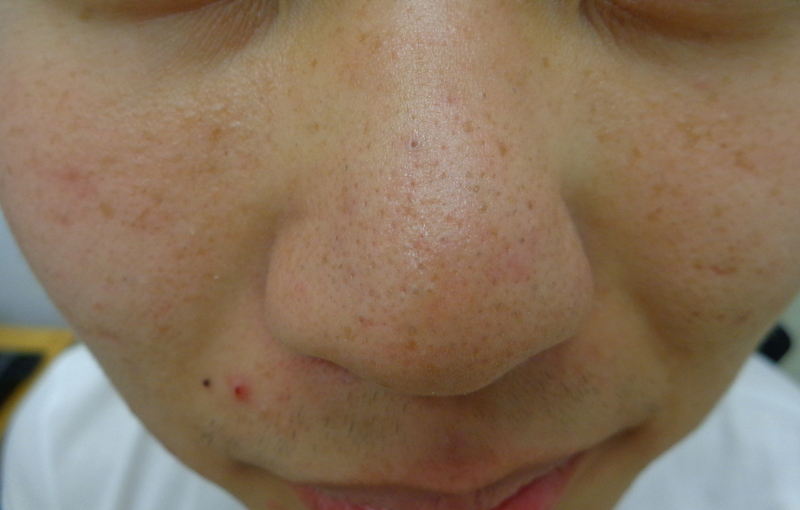 Recurrent outbreaks along the lower cheeks, jawline and neck can be seen with this type of acne. These lesions are frequently more painful and heal more slowly. A pre-menstrual flare-up is often noted. There are many safe and effective acne treatments. However, it takes patience and persistence, at least 6 to 8 weeks, to see improvement in acne regardless of the treatment method (including topical treatment, antibiotics by mouth, hormonal therapy or systemic retinoids). Improvements that may be seen with treatment include fewer acne lesions, less severe inflammation in the papules/pustules and more rapid healing. As inflammation heals, the acne spots may appear pink, red or even purple and in some people they may leave a brown mark that usually, but not always, fades with time. In severe acne, scarring can occur because of deeper, more severe inflammation, nodules and cysts. Acne is often characterised by flare-ups and acne free periods. This may continue for 3 to 5 years, but with consistent and persistent treatment the flare-ups can be minimised and long-term side effects reduced. Avoid abrasive scrubs, toners and cleansers. Avoid hot humid areas and tight clothing in acne prone areas. Glycolic acid preparations (10% or greater concentration is needed). All of the above may cause irritation and dryness in some people. Reduce the frequency of application if this happens. Stop using the product if severe irritation occurs and see your doctor. Topical retinoids (either alone or combined with benzoyl peroxide) to help remove the skin plugs (whiteheads and blackheads). This is also known as a comedolytic treatment (“comedolytic” is the term used to describe a product or medication that prevents the formation of comedones such as whiteheads and blackheads). These preparations may cause dryness in some people and may need to be applied less frequently. Stop using the product if severe irritation occurs and see your doctor. Prescription oral preparations are prescribed by your doctor or dermatologist to suppress acne which has more widespread comedones and acne pimples that are more inflamed, deeper and larger. Oral prescription-only medications include antibiotics, the oral contraceptive pill and anti-androgens. A topical comedolytic treatment is usually prescribed. Examples of antibiotics which may be prescribed include doxycycline, minocycline and others. Anti-androgen therapy (such as spironolactone or cyproterone acetate). Light microdermabrasion, chemical peels or laser and light systems may help mild acne. However, these treatments may not be effective long term and may need to be repeated regularly. They are not suitable for persistent, severe or scarring acne. Mild lesions (blackheads and whiteheads) can be expressed or removed by light diathermy. Larger nodules and cysts may be injected with steroids to reduce the inflammation. 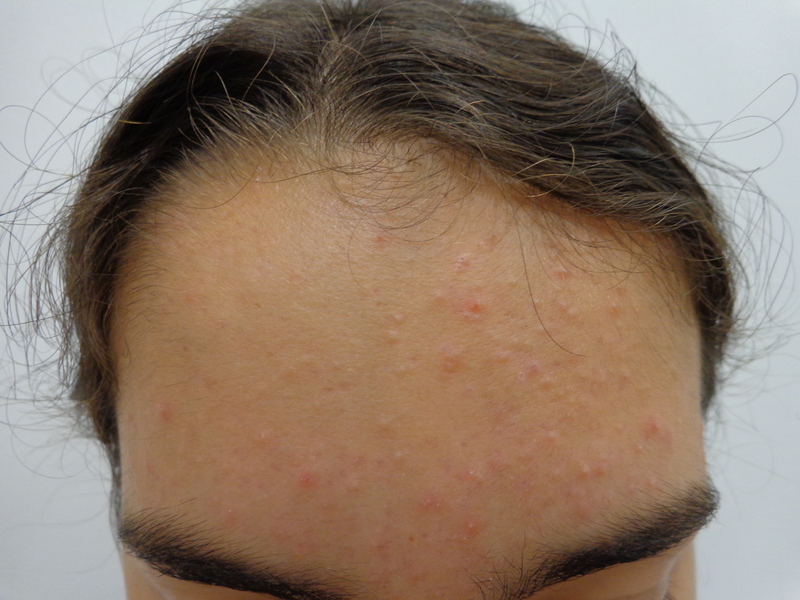 What is the likely outcome of acne vulgaris? Acne is often characterised by flare-ups and acne free periods. This may continue for 3 to 5 years, but can usually be suppressed with treatment. Acne improves and in most cases disappears after adolescence. Some people with a family history of difficult acne or those associated with hormonal flare-ups may continue to have acne well into their forties. 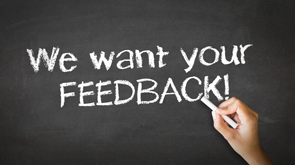 Sometimes treatment needs to be reviewed by the prescribing doctor to “fine tune” management and alter treatment if it is not effective. It is always important that the doctor explains why any treatment is recommended and what can be expected.